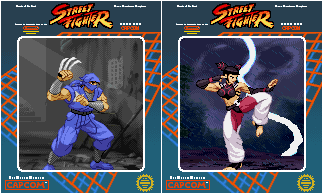 New sprites of Street Fighter 1’s Geki (an often-requested sprite) and SSF4’s Juri (a few people asked for her, too) help to kick off the new Street Fighter Custom Sprites page. There isn’t a lot there yet, but I figured today would be a great day to set up the gallery. Of course, they’re also in the main image generator that I used to make the graphic at the top of the post. 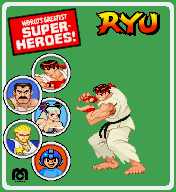 No promises, but I might make a few more Street Fighter sprites to add to this update, even after the anniversary day is over. Always wanted to do a tribute to that Super Street Fighter II intro and this seems like a good time to do it! Today would’ve been the 100th birthday of the late, great King of Comics, Jack Kirby, and this update is filled with characters that he co-created (alongside Joe Simon or Stan Lee) or created himself. I’ve based sprites on his poses over the years because he was able to breathe a fully dynamic sense of life into his characters that they almost seemed to move on the page. In a Jack Kirby comic, every run was a breakneck dash, every punch was a haymaker and even the taunts seemed dangerous. 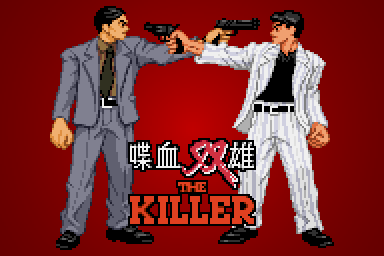 He turned every attribute up to ten (or beyond) in the same way that fighting game sprite artists did years later. We comic fans owe him a lot and this update is in his honor. With this being the 100th birthday, I felt that I had to do more than usual, so I hope you enjoy this tribute to his work. – Marvel: Mr. 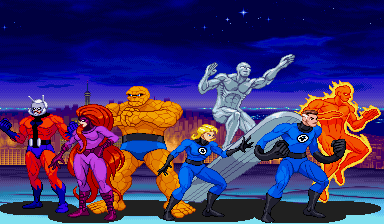 Fantastic, the Invisible Woman, the Human Torch, the Thing, Thor, Ant-Man, the Wasp (new outfits & fixes for the 2016 sprite), the Silver Surfer, Medusa, M.O.D.O.K. 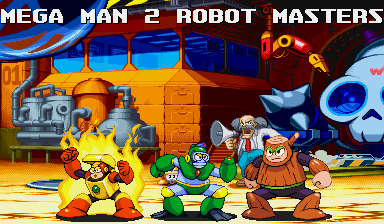 All these sprites, along with some new mini-logos, have been added to the main GFX image Generator, where I made the fake screenshots at the top of this post. 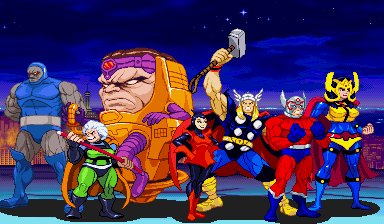 I also completely remade all the Marvel face portraits for the Mego card tribute in the main image generator, even the characters who already had Capcom sprites. edit: after a bit of rest, I’ve added the mini-logos to their galleries. 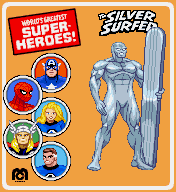 Marvel gets Ant-Man, Medusa, MODOK and two for the Silver Surfer. DC gets Big Barda, Granny Goodness, Orion, and OMAC. The 8th month is in its 9th day, and that’s the day this site pays tribute to a year unlike any other year: 1989. That year was so packed that I dedicated a small section of the site to it in 2009, the 20th anniversary of so many of this site’s favorite games that I just put it all in one update. 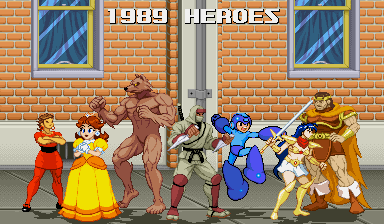 In 2014, the 25th anniversary, I spent nearly the whole year doing updates with nothing but 1989-related content, because doing updates filled with Final Fight, the Revenge of Shinobi, Strider, Golden Axe, Teenage Mutant Ninja Turtles kinda just looked like regular site updates here anyway. Now it’s a yearly thing here, where even non-game items from 1989 get in on the fun. Now we’ve got the info dump out of the way, let’s get on to what’s new to the site today! All the sprites and most of the logos have been added to the image generators so you can make your own fake screenshots and graphics. 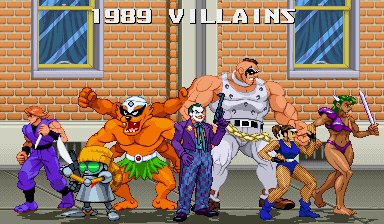 New to the main fighting-scale generator is a remake of the beginning of scene 2 from the arcade TMNT game. River City Ransom: Underground from Conatus Creative Inc., a revival of Technos’ English localization of Downtown Nekketsu Monogatari (1989), plays more like something fans like myself hope and dream for than something we’d actually get. It expands everything, from the combat system stats and storyline all the way down to lovingly crafted item descriptions., but adds enough of its own spark to make it feel fresh. Yes, it’s tough in the beginning, but so was the original River City Ransom when I played it, so their changing things up a bit actually makes it feel more like the first time of playing the old RCR than the hundredth. That’s not an easy magic trick to pull, but the crew at Conatus did it. You’ve probably at least heard someone mention Fire Pro Wrestling World recently. and there’s a lot of reasons for it. Picking up where FPW Returns for PS2 (which I also own) left off means that it’s already deeper than any wrestling game you’ll find on the market now, even though it’s only in Early Access. It’s not your average wrestling game and takes a while to adjust to the timing-based play style, but search the internet and you’ll find enough info to help you get into the game. I’m sure you won’t be surprised to know what kind of Edit Wrestlers I’ve made for it so far (nothing good enough to upload yet). That wraps up this year’s Revenge of 1989. I know I didn’t get around to a lot of games (I’ve still got a few sketches that I didn’t have a chance to turn into sprites yet), so I apologize for any of your favorite games being left out. Maybe I’ll get to some of those others (like Alpha Denshi’s Gang Wars) next year.